As the first manifestation of socialism, the Russian Revolution and the Soviet Union are critical topics for revolutionaries and communists to study today. This study has to be engaged not solely for intellectual purposes, but for the purposes of learning from and incorporating the lessons of this revolutionary experiment into our world outlook and daily activity. It is in this spirit that we offer the following study and discussion guide for the Party for Socialism and Liberation’s new book, Storming the Gates: How the Russian Revolution Changed the World (available for purchase here). The questions below are intended to help with both the comprehension as well as to encourage a critical reflection of the text. In other words, they are designed to help with understanding as well as application. We believe that study should be a collective activity, and that we can learn invaluable lessons from our comrades in the struggle. While this guide can be used on an individual basis, we encourage everyone to study with others, and to seek out not only comrades, but also friends, co-workers, community members, or relatives to join you. If you are near a PSL branch, be sure to check to see if they have a study group for you to join. And if you are interested in starting a study group, the educational workers at Liberation School would be happy to help! Let us know! Why is it so important that we have a definite position on the Soviet Union? What is the significance of the Soviet Union’s presence as well as its absence after 1992? What was unique about the Bolshevik Revolution compared to other revolutions such the American and French Revolutions? What is identified as the primary driving force that led to the Bolshevik Revolution and why is this significant in the contemporary context? What were the far-reaching benefits and significance of the rapid industrialization of the USSR? What problems did this pose? What was the USSR’s goal after WWII and how did the imperialist powers define the global class war in this era? Why does it make more sense to refer to this period as the “global class war” rather than the “cold war”? Why do you think this phrase is more politically useful for the working class? What were the vulnerabilities and causes that led to the demise of the USSR? What are some of the contemporary implications of this? What lessons can we incorporate today? Why was the demise of the USSR so demoralizing for the worldwide communist movement? What does Becker suggest the role of an aging party leadership have to do with the demise of the dynamic, fighting spirit of the CPSU? What role did Gorbachev play in opening the doors of counter-revolution? Discuss the context in which the PSL was formed and what this means for the challenges ahead. 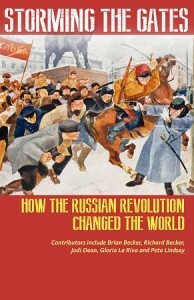 What lessons can be learned from Lenin and the Bolsheviks’ role in the Soviet Revolution as outlined by Becker? Come up with at least 3. Discuss Lenin’s vision of the role of the oppressed in a newly formed proletarian state. What might this look like in the US? What is democratic centralism and why was Zinoviev and Kamenev’s violation of it such a huge mistake? Think of a contemporary example where a violation of democratic centralism would be harmful to the movement. Why was the support from workers in other countries so important to the success of the Bolsheviks maintaining power after they seized it, even though the revolutions in other countries failed? What does this suggest about the importance of international solidarity today? Discuss Marx’s quote from The Eighteenth Brumaire. What is this important for analyzing the Soviet Union? How can it help in winning others to the side of workers and the oppressed? Are there any distinct similarities between the world of 1917 and the world of today? How are they different? What does the chapter offer in terms of understanding how the USSR survived until 1991? Why was revolutionary optimism important in 1917 and why is it important for the movement to revive socialism in the US today? What is one way we can foster it? What were the three tasks of the newly formed proletarian state in 1917, according to Marcy? (26) Are any of these tasks relevant for the tasks of the communist movement in the US today? What was “war communism” and why was it significant? What role did the Bolshevik Revolution play in ending WWI? And what impact did the end of the war have on the Revolution, and on the world? Why was the working class throughout Europe after WWI developing a favorable attitude toward the Soviet Union? How did this prevent the imperialist forces from more aggressively attacking the USSR? Can you think of other examples of this kind of solidarity? What would it look like today? What led Lenin to reformulate Marx’s slogan, “Workers of the world unite!” to “Workers and oppressed people of the world unite!”? Is Lenin’s reformulation still relevant? What five words would you use to characterize the hope that the Soviet Union gave to workers and the oppressed across the world? What different kinds of gains did the Soviet Union make? What difficult conditions did they make them under? What hope do these accomplishments offer today’s movement? Revisit the quote from Marx’s The Eighteenth Brumaire from the previous chapter. Find at least two ways the quote is relevant to this chapter. Why does La Riva argue that the defeat in Afghanistan was a pivotal moment in the ultimate implosion of the USSR? What is the underlying basis for La Riva’s insistence on socialists’ continued support for the former Soviet Union? What does this point to in terms of international solidarity in the present moment? What does it suggest in terms of our orientation toward other socialist countries? What was the role of women in the February Revolution? What were the historical events and material conditions informing their demands for land, bread and peace? What led to Lenin’s exile in Switzerland? How did it impact the movement in Russia? What does this period tell us about the role of the Leninist Party? How is this relevant to communist parties that operate above ground? What was the central point of Lenin’s April Theses and how did it shape the October Revolution? What does it signify about the importance of revolutionary politics and leadership? What led to workers’ turning against the provisional government in favor of Lenin’s insistence on all power to the Soviets? Were these material or ideological factors, or both? The Bolshevik Revolution transformed the idea of socialism from an ideology to an actuality. What is the worldwide significance of this experience, then and now? How have the imperialist countries used the fact that socialism was first established in an underdeveloped country to bolster anti-communism? How has this impacted the Left’s orientation t the Soviet Union? What other ways has the Soviet Union been demonized? If you went to school in the U.S. or another capitalist country, were you exposed to this propaganda? What propaganda was it? Think about specific incidents if you can. What achievements were lost after the Soviet Union imploded? The slogans of the Bolshevik Revolution and the French Revolution were significantly different. How were they different, and why did this matter? What is the relationship between slogans and the struggle today? Have you noticed a correlation between the slogans advanced at certain protests or in certain movements, and the tenor of those protests or movements? Why or why not? How would you summarize what Becker calls “Gorbachev’s retreat”? What were the objective factors, and what were the subjective factors? What does Lenin mean by opportunism? Why did he conclude that socialist leaders’ capitulation to their respective country’s involvement in WWI was a blatant example of opportunism? What connections does Becker make between the opportunism of socialist leaders during WWI and the nationalist opportunism of the anti-war movement in the US? If the struggle against opportunism and national chauvinism is a permanent task, what does it look like today? What does it look like in your branch or wherever your political activity takes place? Do you need to prioritize that struggle more? If you do, then what steps might you take to begin? If the anti-war movement is central to building international solidarity and challenging opportunism and national chauvinism, how can this movement be advanced in your local context at this particular moment? What groups in your region can you identify that are potential partners in a broad-based anti-war coalition? How did Marx’s position on the national question concerning Ireland change? Why did it change? How did Marx’s changing position on Ireland contribute to his understanding of the self-determination of oppressed nations? How did Marx’s position influence Lenin and how does it inform our movement today? How did Lenin solve the problem of united workers and peasants in the context of extreme national oppression and discrimination? Discuss Krupskaya’s life. What led her to become a revolutionary? What were some of Krupskaya’s contributions to the women’s question and women’s liberation? What were Krupskaya’s contributions to socialist education as a necessary part of the process of the development from capitalism to socialism? What other women revolutionaries do you know about? Check out the Women’s Liberation section on Liberation School for more information! Who was Alexandra Kollontai and what were her major contributions to the Bolshevik revolution? Discuss the importance of women’s working day? Why does Kollontai argue that rights are not enough? What do you think about the fight for rights and the fight for revolution? How do they relate? How does Lindsay describe the old racist line used by the US capitalist class political establishment to dismiss Black communism? Why was the Bolshevik Revolution held in such high esteem by so many Black Americans? What connections do you make between this chapter and La Riva’s previous chapter on self-determination? Discuss the significance of Langston Hughes’ favorable opinions of the Soviet Union and why they tend to be ignored in public K-12 schools during Black History Month? Who can you share this revolutionary legacy with in your own life? How should you approach them? What do Hughes’ insights from his time in the Soviet Union tell us about the achievements of the Bolshevik Revolution? What can the movement for socialism today learn from the Soviet example? How did the Soviet Union contribute to the tradition of anti-colonial film? Do you know of any other anti-colonial artistic movements or pieces? What is one way that we can incorporate the arts into our agitation today? What is the primary purpose of Lenin’s text? What is the significance for this moment? Has it changed over time? Why does it matter that we base our political theories in analyses of history and experience? What were the main differences between the 1st and the 2ndInternationals? Do these differences exist today in political organizing? What happened to the German Social Democratic Party after Marx’s death, and what are some lessons that we should take away from this period of time? How did Lenin’s view of the state change over time? What were Lenin’s April Thesis, and were they a departure from his previous writing? What is the difference between utilizing the bourgeois state vs. smashing the bourgeois state and creating a new state? What insights and historical accounts offered throughout this volume may be mobilized to counter these challenges? How can you use this book to reignite the hope that revolution can lead in an egalitarian direction? Dean offers fresh theoretical insights providing us tools through which we can strengthen our capacity to project revolutionary optimism, without which our capacity to spread confidence in the revolutionary project is limited. How might this passage inform your current work building and planning the movement? Why does Lukács argue that the party is both the product and producer of the revolutionary mass movement? Why is this point so critically important? What connection does it have to the idea of revolution as future actuality? How do you understand the crux of Hardt and Negri’s argument about biopolitical capitalism? What is Dean’s primary argument against Hardt and Negri? What do you think about it? Why does Dean argue that Hardt and Negri can’t “anticipate the revolution”? What does Dean leave us with in terms of our role in the party as both product and producer of the inevitable future?